The running sneaker and sports apparel business changed sneakers drastically with the introduction of “Free” and “Minimalist” running sneakers. It’s important to understand the difference between these two and a traditional running sneaker and how it can affect your joints and performance. WHAT’S THE DIFFERENCE BETWEEN BAREFOOT, MINIMALIST AND A TRADITIONAL RUNNING SNEAKER? Minimalist Running Shoes are in-between barefoot running shoes and traditional running shoes and sometimes referred to as racing sneakers. They have a reduced heel-to-toe drop (HTTD) between 4–8 mm, reduced cushioning and reduced or no arch support. The toe box is usually in-between traditional and barefoot running shoes. Traditional running sneakers typically have a 9-16mm HTTD with more cushioning and some arch support, also slightly heavier. In an effort to cut weight on a traditional running sneaker they cut back on cushioning and arch support to make a racing or minimalist running shoe. DO YOU NEED TO PAY ATTENTION TO (HTTD) HEEL TO TOE DROP? Yes, The problem is that most running shoes were made with a 12 mm HTTD before the introduction of the minimalist running shoe. Now the popular HTTD seems to be 4mm, like the Saucony Kinvara I wore for the NYC Ironman in 2012. I was initially running with 10-12mm HTTD. I developed heel pain (plantar fasciitis) and eventually Achilles tendonitis leading up to the day of the race. At approximately mile 15 of the marathon, I felt my Achilles gently pop. 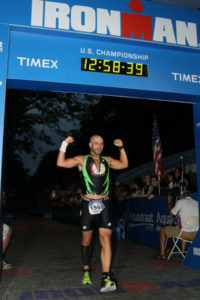 At that point during the Ironman competition, your whole body feels pain, and the Achilles was sore anyway. All I could think about was the hard work, dedication and countless 6-hour early morning workouts leading up to this day. The adrenaline and the brain were telling me I was fine. So, I kept running in my 4mm HTTD running sneakers and eventually developing a small Achilles tendon tear. DOES A LOW HEEL TO TOE DROP (HTTD) IMPACT PERFORMANCE? A Harvard University study was done that focused on the impact of running barefoot versus running with shoes and its effect on foot strike. The New York Times, Runner’s World, Wall Street Journal and several others followed up with their articles on the study, and the “barefoot craze” took off. Traditional running shoes tend to feature more cushioning, elevated heels and this usually leads to extra weight. This causes many runners to heel strike first. Dr. Daniel Lieberman, one of the leading researchers of the Harvard study, states that forefoot and mid-foot striking does not cause the sudden, significant impacts that occur when you heel strike. The study concluded that barefoot (mid-foot striking) runners can run on hard surfaces without discomfort from the landing. 3 DIFFERENT TYPES OF FOOT STRIKE, WHAT’S BEST? The heel strikes the ground, then the lower leg comes to a stop or slows down during impact with the ground while the rest of the body continues to move across the knee. Many runners who wear traditional running shoes with an HTTD of 12-16mm are usually heel strikers. The heel strike cycle absorbs 2 to 3 times the body’s weight upon impact. The ball of the foot lands first, while the heel may lightly brush the ground. The force of the impact on the larger foot surface, coupled with the knees help to absorb much of the impact. Similar to a mid-foot strike. The ball of the foot makes an impact with the ground proximal to the fourth and fifth metatarsal, while the heel may brush the ground gently. Besides less impact there’s more bounce radiating to the knees, hips, and back than in heel striking. A study done at the Luxembourg Health Institute published by The Journal of Science and Medicine in Sport showed among 533 participants that there was no significant change in running biomechanics correlated with a heel to toe drop variability, except for a possible impact on knee abduction. DOES HEEL TO TOE DROP MATTER? Like anything else you should go with what is most comfortable, but I do not recommend switching from a higher HTTD height like 12mm all the way down to a 4mm HTTD and vice versa. Gradually transitioning from a 12mm to an 8-10mm HTTD and then further if comfortable. The box and sneaker itself do not label the HTTD on it; You’ll need to do a little research first, here’s an excellent place to start; Google. Likewise, I have found sneakers that are maximalist with a lot of extra cushioning, but with a minimalist 4-6mm HTTD. If you’re not informed correctly either by knowing ahead of time what heel to toe drop is best for you or by a knowledgeable running sneaker sales rep you could be buying yourself a pair of sneakers sure to aggravate a case of plantar fasciitis, Achilles or posterior tibial tendonitis or knee pain. WHAT IS THE BEST HEEL TO TOE DROP HEIGHT FOR ME? If unsure of what HTTD (Heel To Toe Drop) is most comfortable for you and your running style, start with a looking up the HTTD of the sneakers you’re currently running in. If you have forefoot, big toe pain or a neuroma I generally recommend a lower HTTD of 4-6mm. Generally speaking those with heel pain (you should read this article on plantar fasciitis and dangers of flat feet), Achilles and posterior tendonitis I would run with a higher 9-13mm HTTD sneaker. Ideally, you want to gradually raise or lower the HTTD and stick with what makes running most comfortable for you. After rehabbing my partially torn Achilles at Synergy Wellness Chiropractic & Physical Therapy with Cold Laser Therapy, I found that 10mm HTTD is perfect for me to run long distances and short. I hope this article helps you pick the right running sneaker, feel free to comment or call us today at 212-533-4900 if you have any questions. Laurent Malisoux et al., Adaptation of running pattern to the drop of standard cushion shoes, Journal of Science and Medicine in Sport, Nov. 15, 2018. Benno Nigg et al., The Preferred Movement Path Paradigm; Influence of Running Shoes on Joint Movement. British Journal of Sports Medicine, August 1, 2017.